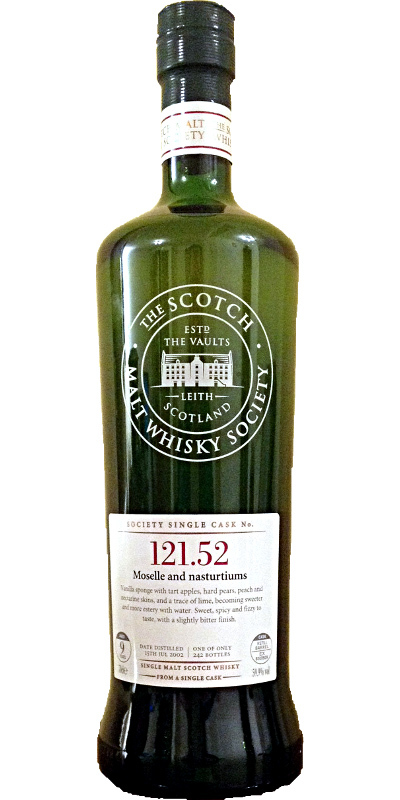 This whisky is called “Moselle and nasturtiums” and comes from a refill ex-Bourbon barrel. Only 242 bottles were made. Sweet Danish pastry, white fruits and vanilla in the smell. Citrusy notes in the background. Young, but rich in flavours. The citrusy notes is here again in the taste, accompanied with burned oak and sweet pears. The burned oak lingers off in the finish with the sweetness and a dash of vanilla and salt. A nice long finish! It is simple, but the balance is good and the flavours are rich. With water, the burn quiets a bit down, and the separate flavours is easier to pick up. Arran never lets you down! I will give this 87/100 (21/22/22/22).